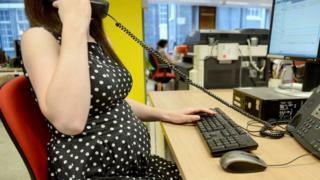 The EU's top court has ruled that firms can dismiss pregnant workers as part of general staff cuts, despite legal protections for pregnant women. The European Court of Justice (ECJ) defended the position of Spain's Bankia - a bank that was bailed out - over its dismissal of a pregnant woman in 2013. In her case, it said, the dismissal was not connected to her pregnancy, so did not infringe EU law. Jessica Porras had been notified of the reason for staff cuts at Bankia. EU Directive 92/85 prohibits the dismissal of a pregnant worker, at any time from the start of her pregnancy to the end of her maternity leave, but allows exceptions under national law unconnected with the pregnancy. The Catalonia high court had asked the ECJ to clarify the EU rules on pregnant workers' rights, after Ms Porras appealed against a court ruling in Mataró, near Barcelona. Pregnancy - to gym, or not to gym? EU law requires an employer to state in writing the reasons for making a collective redundancy, and to inform the pregnant worker of the criteria chosen for identifying those who will lose their jobs. The ECJ says Bankia had consulted workers' representatives about the looming job cuts and had sent Ms Porras a letter explaining its reasons. She had been given a low score in a company assessment, the ECJ said.